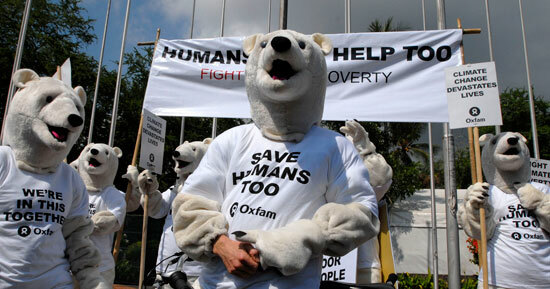 Oxfam's Polar Bears protested in support of humans who are also losing their habitat and natural resources due to Climate Change at the UN Climate Change Conference on Thursday 6 December, 2007. Photo: Ng Swan Ti. Martin Parry, Jean Palutikof, Clair Hanson and Jason Lowe, all four respected and known scientists from the IPCC, have written on The Nature about the dangers of false optimism regarding climate change. They warn that the "damages will be large" if we continue to believe that we have climate change under control. "We have lost ten years talking about climate change but not acting on it. Meanwhile, evidence from the IPCC indicates that the problem is bigger than we thought. A curious optimism [â€¦] pervades the political arenas of the G8 summit and UN climate meetings. This is false optimism, and it is obscuring reality. The sooner we recognize this delusion, confront the challenge and implement both stringent emissions cuts and major adaptation efforts, the less will be the damage that we and our children will have to live with." They also warn that a 50% reduction of global emissions below 1990 levels (note that a 50% reduction is often referred to as "stringent" in the political world), that the G8, EU and the UN climate change conference in Bali last December has urged for, "will not avoid major global impacts." According to them even at an 80% reduction of global greenhouse gas emissions "damages will be large" and "likely to be unavoidable." "Residual damage will be great unless we invest in adaptation now. Much of the damage could be avoided by adaptation, but again, this would require a much larger effort than is currently planned. Ten years ago one of the authors, Martin Parry, proposed that adaptation would be unavoidable. This view was criticized as 'defeatist', but the data now clearly support it." Martin Parry, Jean Palutikof, Clair Hanson and Jason Lowe are just a few of all the other scientists that recently have spoken out about the dangers of playing down the effects and risks from climate change. We need strong actions today. Tomorrow will be too late.